The SIP gateway must be configured as a Trunk. 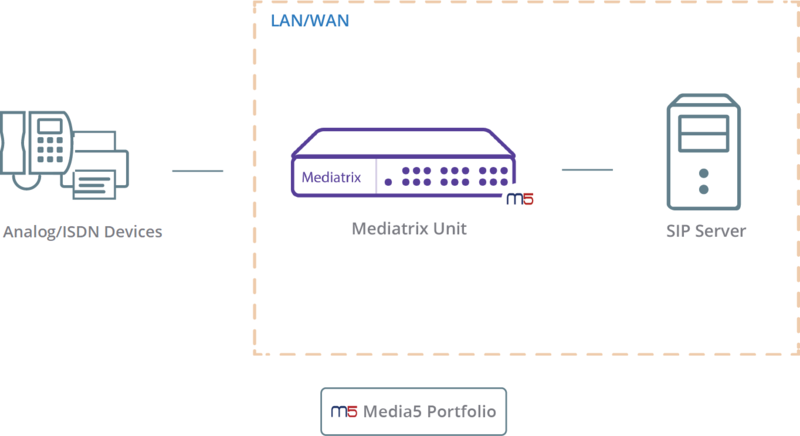 If your Mediatrix unit is configured to use a DHCP server, use the DHCP server-provided IP address. This scenario describes how to perform a Basic Sip Unit Registration for the Mediatrix units. The Network configuration is not covered in this document. For more details on network configuration, refer to the Basic Network Configuration technical bulletin. In the Keep-Alive table, complete the fields as required. If you selected an alternate destination, complete the fields of the Alternate Destination table. Unit Authentication applies to all challenges received for SIP dialog. You can define several user names and passwords for the Mediatrix unit. These usernames and passwords apply to all endpoints of the unit. Click Edit All Entries located at the bottom of the page. In the Authentication table, from the Criteria selection list, select Unit . From the Realm field, enter the provided realm and from the Validate Realm selection list, select Enable . If no Realm was provided, leave the field empty and from the Validate Realm selection list, select Disable . In the User Name field, enter the SIP user name for each entry. In the Password field, enter the appropriate password for each entry. Each gateway will be registered. In the Unit Registration table, in the User Name field, enter a username to uniquely identify the user in the domain. From the Gateway Name selection list, select the name of the gateway to which the unit will register by default. Do not use the local gateway as the unit is unable to register itself. The gateway with the name local uses a specific Registrar/Proxy server that points to the unit's own IP address. The information will be displayed in the Unit Registration Status table such as in this example.